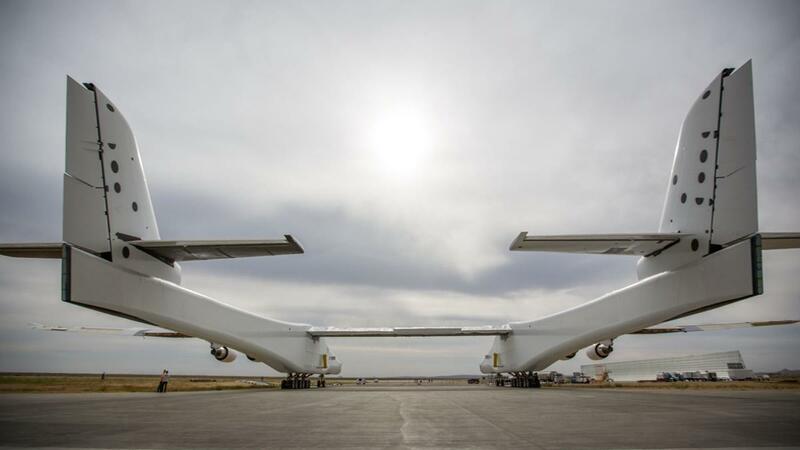 Microsoft co-founder Paul Allen first announced the Stratolaunch aircraft way back in 2011 and after four years of construction in the California desert, the world’s largest plane (by wingspan) rolled out of its hangar for the first time, Wednesday. “Today, we’re moving the Stratolaunch aircraft out of the hangar – for the first time ever – to conduct aircraft fueling tests. This marks the completion of the initial aircraft construction phase and the beginning of the aircraft ground and flight testing phase,” said Jean Floyd, CEO, Stratolaunch Systems Corporation in a release on the official Stratolaunch website. The Stratolaunch aircraft boasts a wingspan larger than a football field and is designed to carry rockets into the stratosphere at about 35,000 feet. Once aloft, the rocket would drop and fire its engines and “air-launch” to orbit. But exactly how big is this plane? 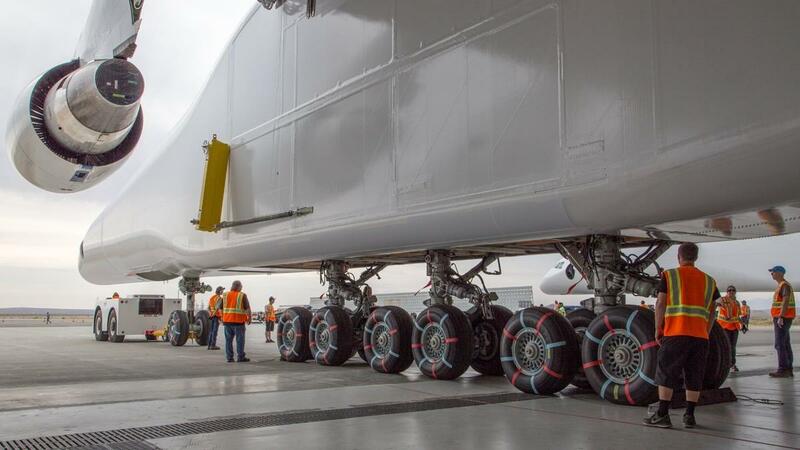 The company just revealed that the aircraft weighs a whopping 500,000 pounds. The wingspan measures 385 feet; 25 feet bigger than a National Football League field. The aircraft is 238 feet from nose to tail and stands 50 feet tall from the ground to the top of the vertical tail. 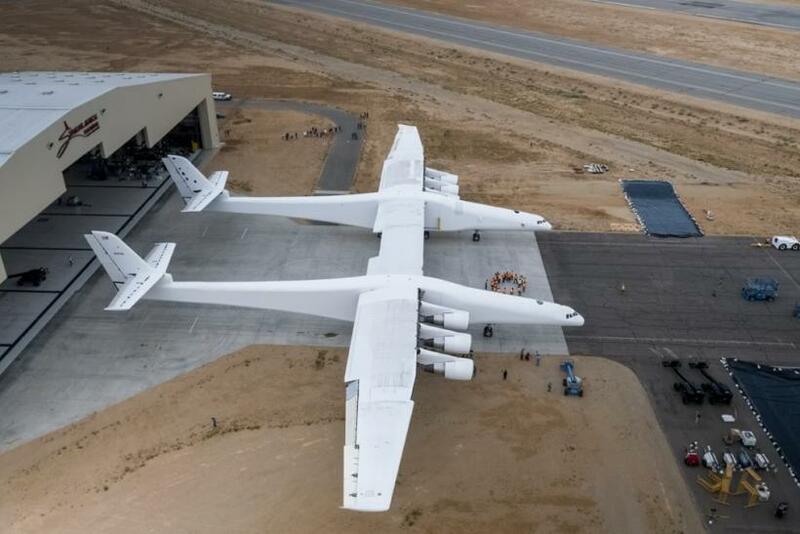 And if that does not already give you an idea of how big the Stratolaunch is, it can hold up a takeoff weight of 1,300,000 pounds, meaning it’s capable of carrying payloads up to approximately 550,000 pounds. Towed from the hangar on its 28-wheel landing gear, this is the first time the aircraft has been publicly displayed, with the team now preparing for fueling tests, engine runs and ultimately a first flight planned for 2019. Allen’s Stratolaunch company partnered with Orbital ATK in June last year to provide multiple Pegasus XL air-launch vehicles to provide customers with unparalleled flexibility to launch small satellites weighing up to 1,000 pounds into low Earth orbit. Pegasus has carried out 42 space launch missions, successfully placing more than 80 satellites into orbit for scientific, commercial, defense and international customers. In June 2004, Allen sparked a revolution in space travel when he funded SpaceShipOne, making it the first commercial vehicle to cross the threshold of space. The project ultimately won the Ansari X Prize, and a $10 million award. He then licensed the technology to Branson and moved on to other pursuits. But with Stratolaunch, he is back in the space business. But Allen is not the only U.S. billionaire who has big dreams, ambitions, and money to explore space travel. Other big names that are slowly but steadily moving toward bringing the future closer are Amazon CEO, Jeff Bezos and Tesla and SpaceX CEO, Elon Musk. In March this year, SpaceX made history by successfully launching a used rocket into space and the company plans to fly two customers around the moon in 2018. Like Musk, Bezos too wants to reuse rockets to drive down the cost of space travel. His company Blue Origin is one of the several entrepreneurial companies that are seeking to lower the cost of access to space, and touch off what Bezos said could become a "golden age of space."